The city of Lenexa was awarded a grant through the Mid-America Regional Council’s Planning Sustainable Places program to study the Quivira Road corridor from 79th Street to 99th Street. The primary intent of the study is to recommend land uses and multi-modal opportunities along the corridor that would build upon current redevelopment activity and area strengths. The corridor was largely developed during the 1970s and 1980s—a typical suburban corridor—and is home to a major regional concentration of retail development, including Oak Park Mall. The corridor has a strong location with excellent access to regional transportation networks, demographic trends that support a wide range of uses, and a stable real estate market with many positive trends. The corridor also has specific properties that are underperforming because of broader changes to the retail landscape. These factors converge to make the corridor an ideal location for mixed-use redevelopment of key sites. 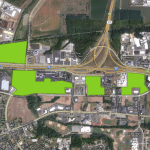 Development Strategies, working sub-consultant to engineering firm WSP, utilized market, land use analysis, and feasibility testing to identify three potential redevelopment sites along the corridor. This included comparing the cost and value of traditional suburban retail, mixed-use development, and other uses to illustrate the potential impact of targeted redevelopment. Development Strategies also provided recommendations aimed at attracting and supporting mixed-use development.